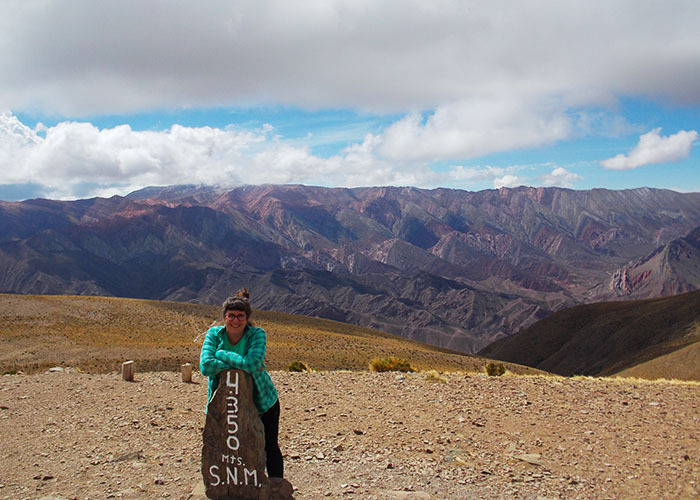 The Quebrada de Humahuaca is an itinerary that has been follow for more than 10,000 years, it goes along an extensive mountain valley, located in the Northwest of Argentina. 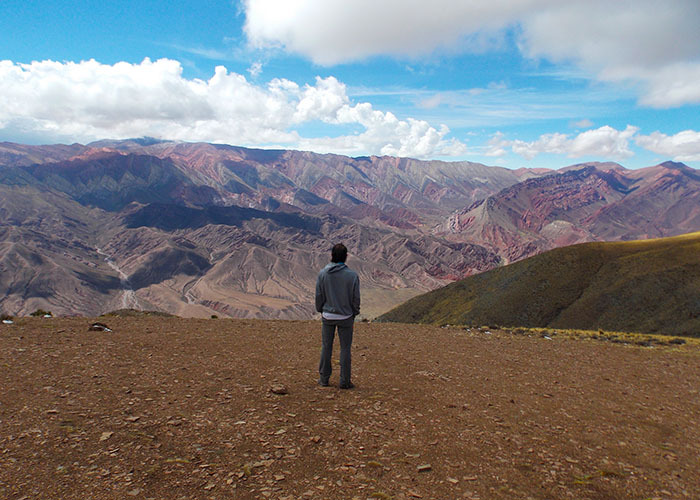 This Andean valley has been a permanent route linking distant territories and different cultures, from the Atlantic to the Pacific and from the Andes to the Southern plains. 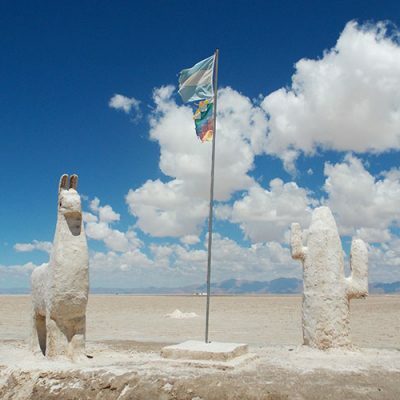 Anyone who decides to drive through the National Route 9 is going to experience an incredible landscape which changes in colors and shapes every few mile we drive, and also we will find the beauty and tradition in the villages, where houses made of adobe and narrow streets remain as they were long ago. 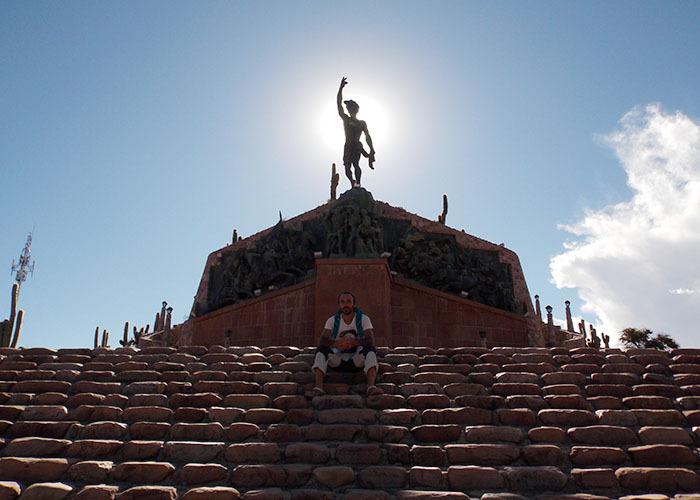 We began the route from San Salvador de Jujuy, capital of Jujuy. 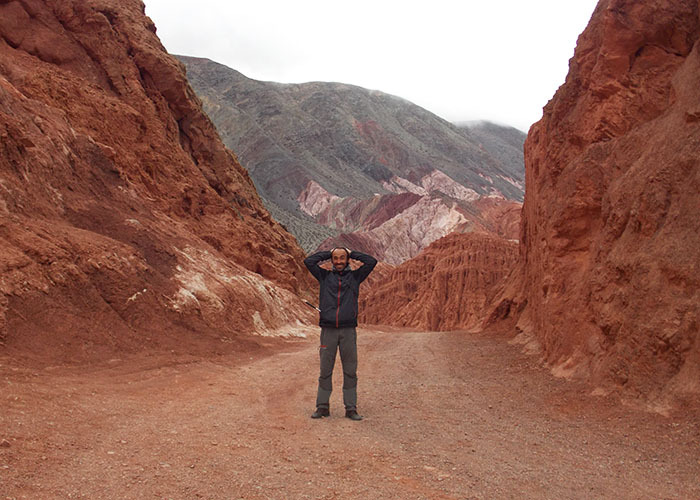 Here you can get a map of the Quebrada de Humahuaca at the Tourist Office located in one of the corners of Belgrado square. If needed, you can also exchange money in Belgrado street, just before the Popular Library. To buy goods for the drive you will find the better prices in the surroundings of the old bus station. Next gas station is in Tilcara, 90 km away. 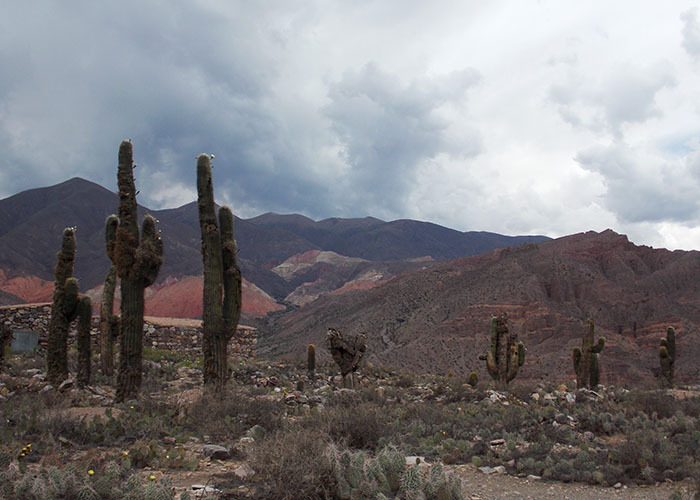 Volcan is the town that marks the beginning of the Quebrada of Humauaca, and Its main attraction is the lagoon that lies between their red mountains. 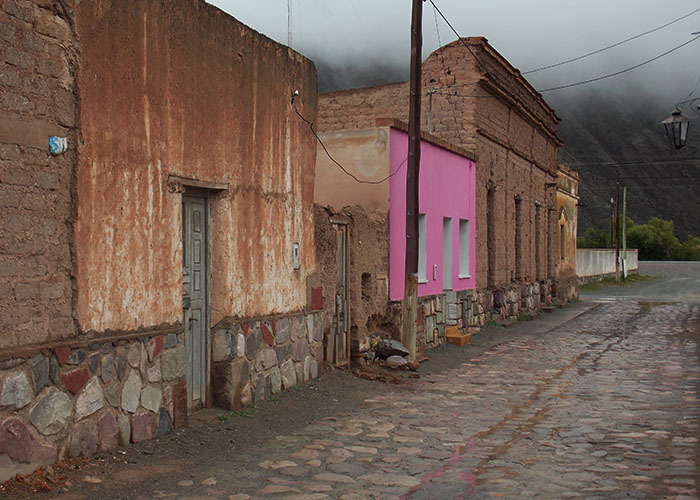 Next place we reach is Tumbaya, a small village with houses made of adobe and solitary alleys to stroll along. At the back of the town begins the path that leads us to the graveyard of the village, right at the top of the mountain, from which we have beautiful view over the village, the river and the mountains where the people from the indigenous community of Punta Corral still living, but no longer keeping many of their traditions and believes. You can walk there or talk to their cacique, who doesn`t even live in the community anymore. We spent the night behind the tourist office, across the train rails. Here we have shadow, picnic tables, grills and drinking water. If you wish you can visit the communities of Punta Corral and Finca Tumbaya, but do not expect to find the essence and spirit of an indigenous community, no by far. As many other, this part of Argentina was punished by the Aztec and the Spanish conquest, and also by the evangelization of the Jesuits. 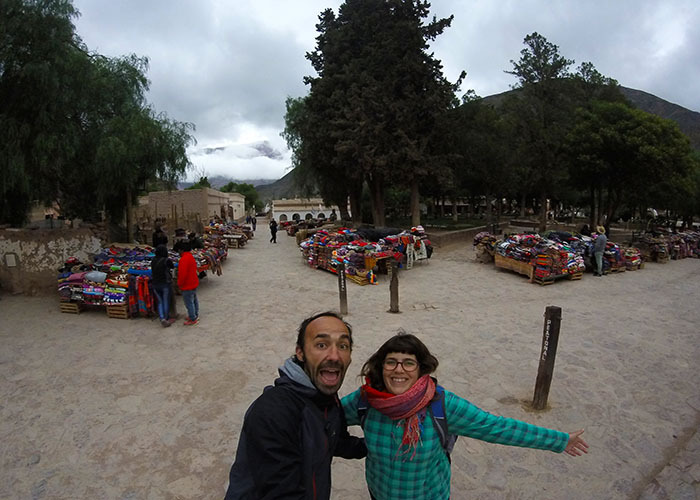 The following day we arrived to Purmamarca. 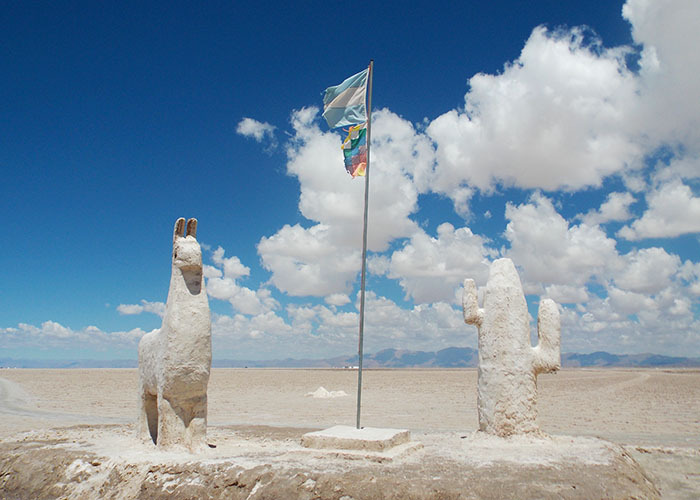 In Aymara language it means “People of the Virgin Earth”. 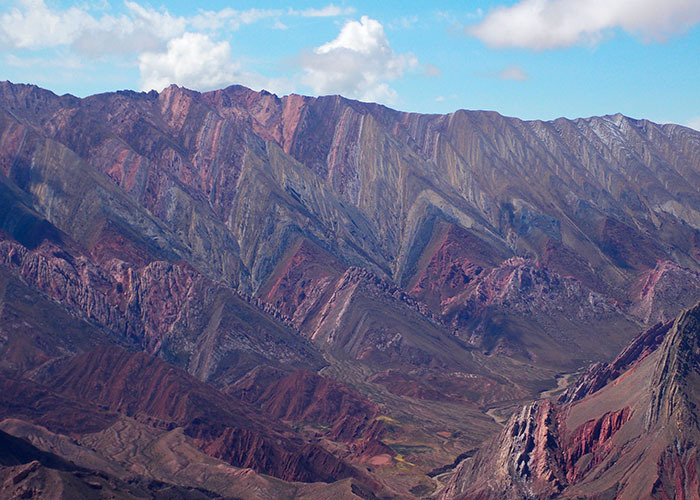 La montaña de los 7 colores “The Hill of the 7 colours” is the main attraction of the town, although we recommend you the “Paseo de los Colorados”. 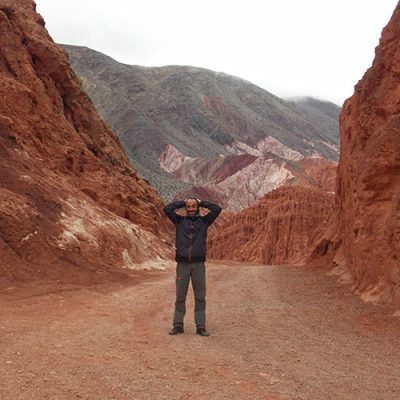 It is a 3 km walk between rocks and mountains of different colors, shapes and textures. Beautifull. Of all the villages we find in this route this is one of the most visited, but without breaking with the tranquility of the place. In front of the church of “quebradeño” style is the main square of Purmamarca, filled every day with artisan and craft stalls. 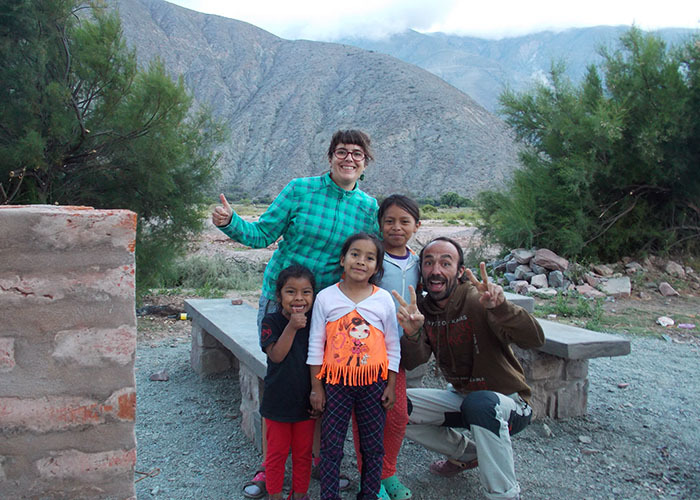 Just a few meters from the beginning of “Paseo de los Colorados” we found a perfect place to spend the night before departing toward the Salinas Grandes, surrounded by mountains and under an amazing sky, where some foxes pass by at night. 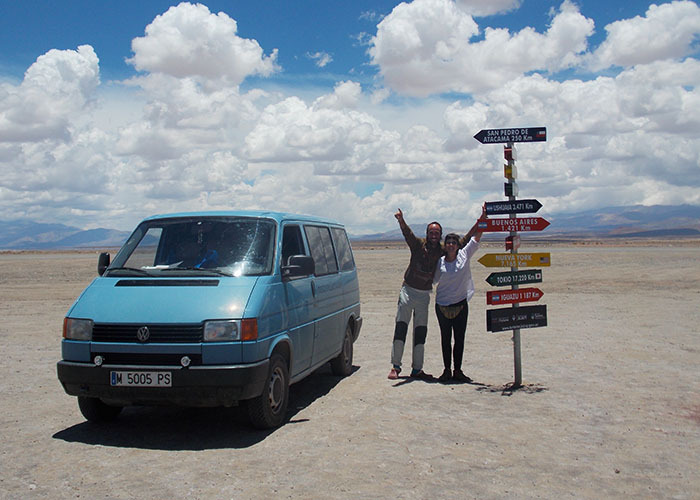 The road to the Salinas Grandes zigzag to the highest point of a mountains with stunning views all the way and then down to the Salinas. 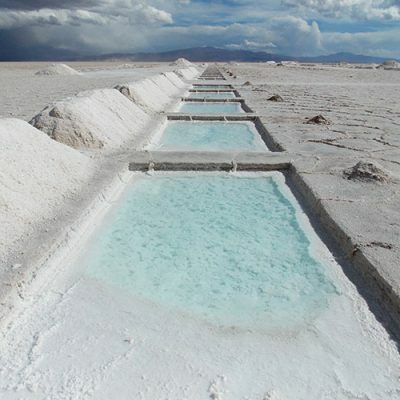 The drive is about 60km that take us to an extension of salt of 215km2, located at an altitude of 3400 meters above sea level. 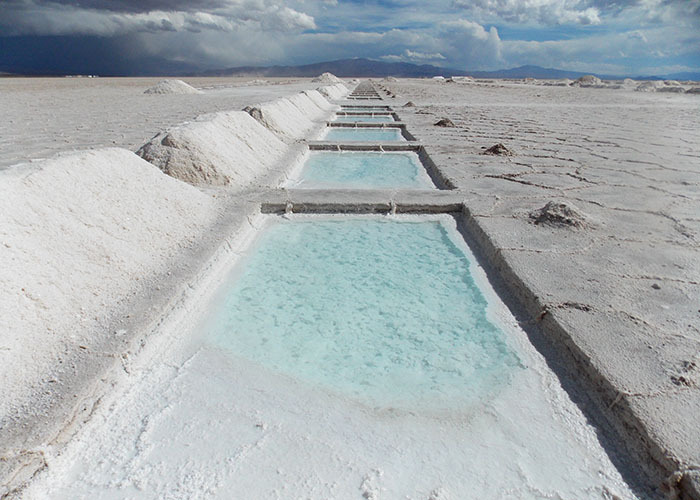 You can walk on the Salinas as much as you want, but the distances seem endless. To enter with your own vehicle you have to hire a guide, although it is not always necessary. 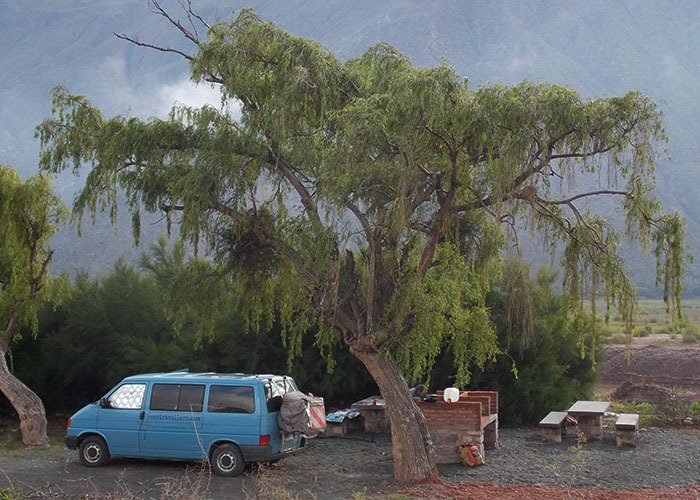 We spent the night in one of the 2 parking spaces from which you have access to the heart of the Salinas. Until 9 in the morning there is nobody to charge for the entrance. You can go on your own for free. To sleep at this altitude means a lack of oxygen, which force us to have to push La Furiosa in the morning as she didn`t want to wake up. The next destination we head to is Maimará or “Star that falls” as it means in the indigenous language. 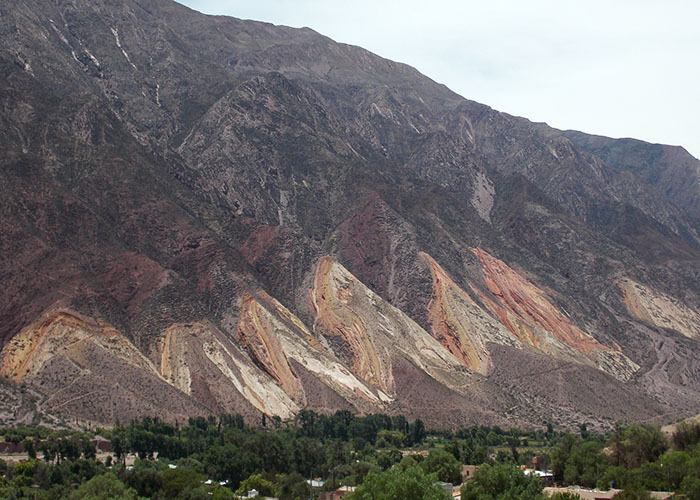 It is in the middle pint of La Quebrada de Humahuaca and on its mountains we find “La paleta del Pintor”; those hills seem to have been colored on purpose. The striking cemetery of Maimará is worth a visit, and from here you have the best views of “Las Paletas del Pintor”. The graveyard is located on the way to Tilcara, on Route 9. 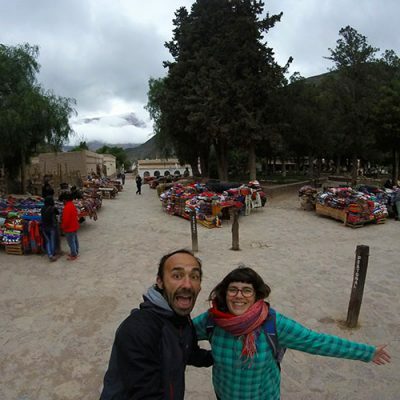 Already in Tilcara, we wonder among its streets, the main square and the market, where both tourists and locals alike buy empanadas and other food that is serve in improvised stalls and cooked in old grills or pans that are part of the charm of the market. 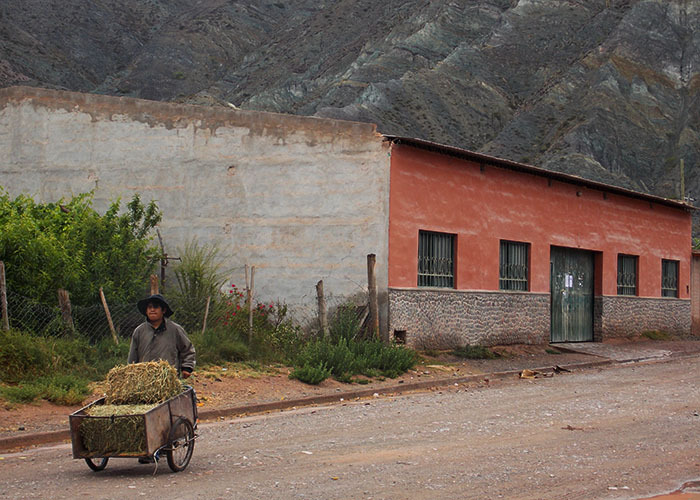 In Tilcara we can walk to Pucará; a prehispanic village at the top of a hill with great views over the valley. The entrance has a small fee. Fortunately the workers were on strike the day we arrived and we were able to get in for free. No far from Pucará we can cross a bridge that takes to “La Garganta del Diablo”. The road extends for 6km and after it there is a stall where you have to pay 15 pesos if you want to walk deeper into the gorge to reach a waterfall. The whole route can be done by van or on foot. It is a shorter distance if you decide to walk. After 6pm there is nobody to charge for the entrance. 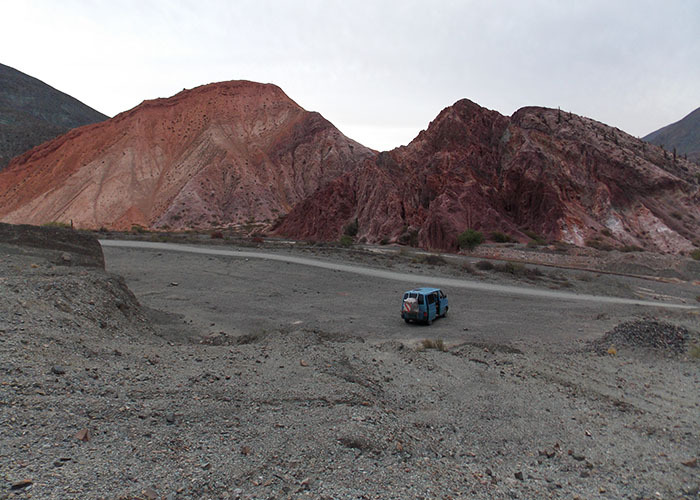 After spending the day in Tilcara we decided to keep driving along the Quebrada “Gorge” in search of a place to spend the night. 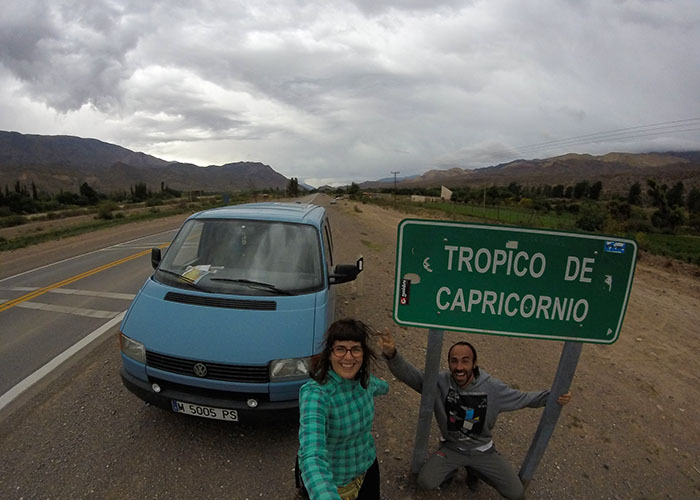 Soon after we leave Tilcara we cross the Tropic of Capricorn, in Huacalera. It is represented by a monolith of a Solar Clock. The next village we reach is Uquia, where we decide to overnight. Have a look to the Ángeles Arcabuceros “Arquebussiers Angels” in the church of Uquia, these angels were painted by indigenous after the Spanish conquest. The indigenous did not know how to draw an angel, as they didn`t know what it was, therefore they had to asked the Spaniards how they were. The Spaniards told them that the angels were as themselves, the Spaniards, but with wings. And it is the reason why the angles were painted holding on their shoulder a great arquebus (rifle). 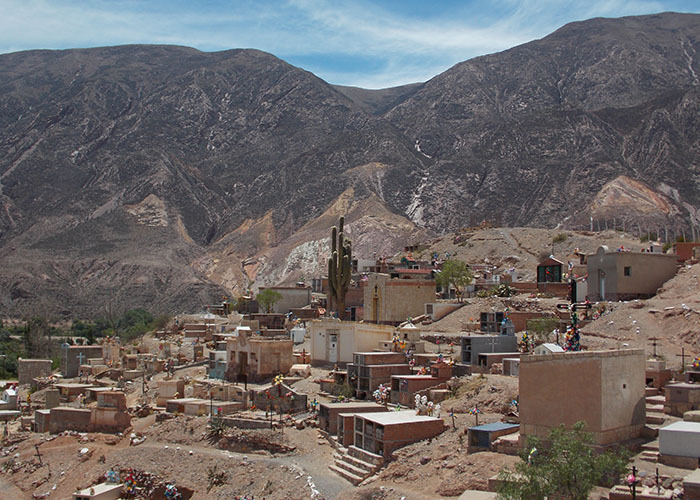 Our last destination is Humahuaca, which means “Sacred River”. Is the capital of the Quebrada and its main icon is the Monument to the heroes of the Independence. 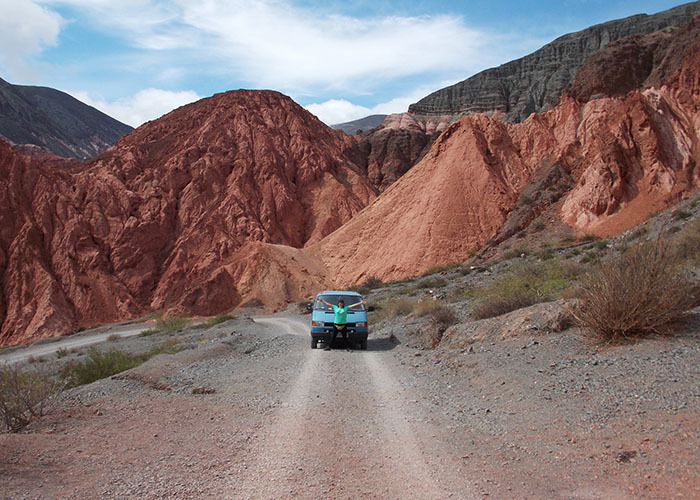 Have you driven the Quebrada Humahuaca Road? Would you like to do it?